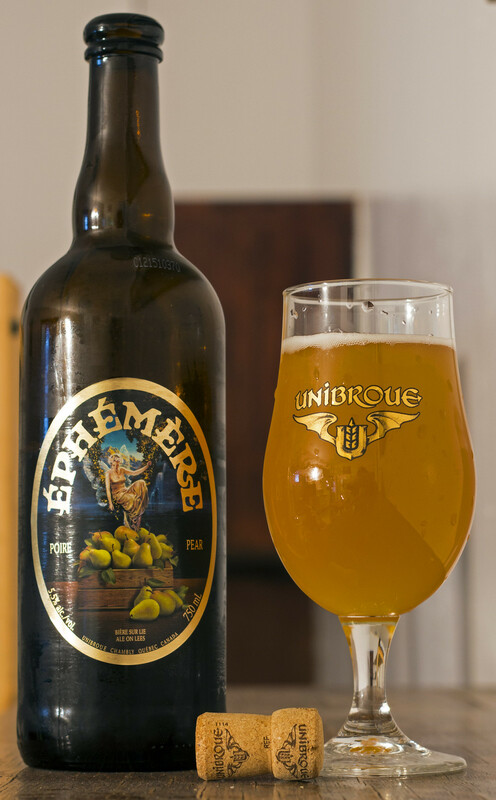 As much as I love Unibroue, sometimes I feel like they're running out of ideas - so they use their Éphémère line to compete with brands like Bud (Light) Lime to try to woo people into buying their products in the fruity beer market instead of the competition. At first it was just Éphémère classic, then just the pomme (apple) and framboise (raspberry). Then over the years they made a cassis, cranberry, cherry and soon.. a peach version of Éphémère. The newest one I've found was the Éphémère Poire (Pear), I'm not a fan of pears, and most pear beer I've had were fairly bland, and frankly.. aside from the Raspberry and Cassis Éphémères, I've never really enjoyed this line of beers because it's generally far too mellow and has a fake OR stale fruit taste to it. With all that being said, it's mean to be the fruity summer time wheat beer, that you drink on patios while you're instagraming your large juicy bacon cheese burger topped with maple bacon, Dr Pepper BBQ sauce, cheese curds instead of processed cheese and juicy grilled beef.. om nom nom! Okay, I wish I was eating that right now... but here we are. On with the review! Appearance: Unibroue Poire pours an unfiltered golden ale, very hazy with a decent amount of carbonation. A bit of snow white head on top just sparkling at me. Aroma: The first thing that this beer makes me think of is Blanche de Chambly, it has similar notes that are quite reminiscent of Unibroue's popular classic witbier. It's fairly light but yet aromatic with notes of various fruits - mostly pear, of course. Notes of apple peels, a bit of coriander, lots of bubble gum sweetness and a hint of lemony citrus to top it off. I dislike pears in every sense, beer, food, etc but this beer is smelling better than its sister beer, Éphémère Pomme. Taste: Very very grainy, lots of the typical Unibroue yeast just hits you right in the middle of the tongue. There's a great deal of bubble gum sweetness, as well as a bit of a pear sweetness that turns into a bitterness that lingers as an aftertaste for a while. Very reminiscent to a Blanche de Chambly. Overall Thoughts: This is one of the better beers in Unibroue's Éphémère series. Very comparable to the very popular Blanche de Chambly, with more of a bubble gum and pear sweetness to it. Very smooth on the palate, easy to drink. This is going to be a decent seller on hot summer days, but unfortunately we will see Bud Lime Cranbrrrita end up beating out this beer in sales.